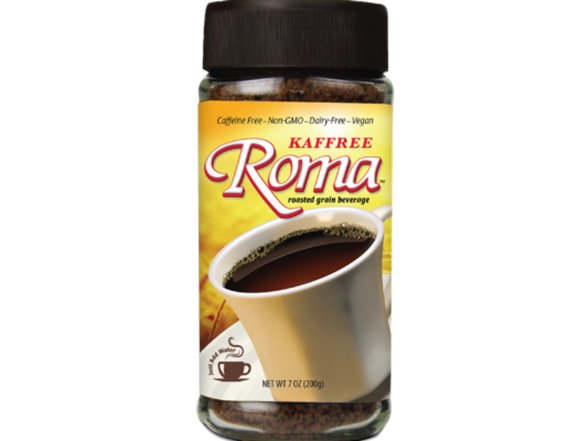 (4) - Kaffree Roma Roasted Grain Beverage - 7 oz. Kaffree Roma roasted grain beverage is a delicious and satisfying caffeine free coffee alternative. Just add a teaspoon or two to your favorite mug filled with hot water and enjoy the robust, full-bodied taste of coffee without the caffeine or tannic acid of coffee beans. With low acidity, drink anytime without the fear of an upset stomach. 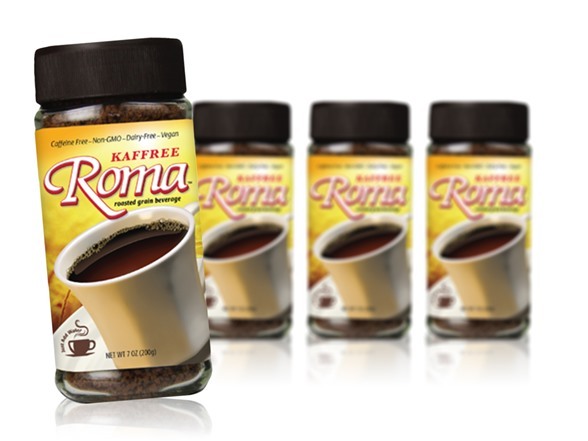 Kaffree Roma can also be included in desserts such as cakes, cookies and more. Shelf stable and easy to prepare. Ingredients: Roasted barley, roasted malt barley, roasted chicory. 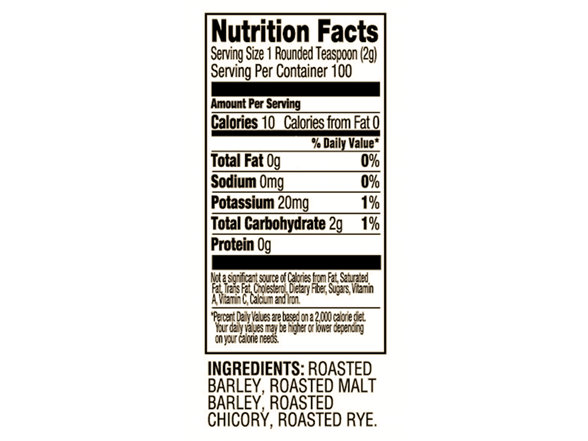 See images for nutrition information. Vegetarian food that’s not just for vegetarians. At Atlantic Natural Foods, we know there are limited resources on our planet, and too many people with not enough to eat. Our mission is to provide great solutions to both these problems. As with most big changes, it starts with small steps. If everyone just ate one meatless meal a week, the amount of water, crops, fuel, land, and greenhouse gas emissions saved would be staggering. Whether it’s one meal a week or every meal you sit down to, we’re committed to offering deliciously versatile and nutritious vegetarian and vegan meat alternatives, complete meal solutions, baking mixes, egg substitutes, and caffeine-free grain beverages that make choosing natural plant-based foods easy, convenient, and satisfying for everyone. Atlantic Natural Foods is the largest manufacturer of shelf-stable plant-based proteins in the U.S.. We strive to manufacture vegetarian products are low in salt, fat, and free of cholesterol. Meatless beef, chicken, pork, lamb, and seafood are all within our “wheelhouse” of capabilities. Our management team has over 120 years combined experience in food processing and production. Our facilities are Level 3 SQF Certified, HACCP Certified, and Kosher Certified.